"AbLoads protects bridges, structures and drainage assets valued at £65 billion. " "AbLoads software processes more than 735,000 abnormal load notifications each year. " "AbLoads used in 60% of Highways England Agency Areas. " Process abnormal load notifications quickly, accurately and efficiently. Managing the abnormal loads notification process is a costly exercise for all those involved. It adds nothing to the bottom line and it doesn’t generate any revenue. Yet it must be done to safeguard bridge and other structural assets. AbLoads provides Structure Owners with every facility they need to manage, check and reply to Abnormal Load Notifications quickly, efficiently and accurately. AbLoads is usually operated by non-technical staff. With a wealth of time saving features built in, an experienced operator can process, check and respond to 185 notifications each day. All the data within AbHaulier notifications, produced using AbLoads sister software, is entered automatically. AbHaulier notifications can be processed and every structure along the route checked in under a minute. ESDAL notifications take 2 – 3 minutes. 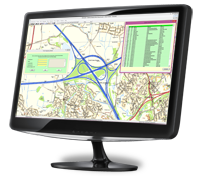 AbLoads databases of previous routes, standard routes, haulier and vehicle details enables an operator to add the notification detail from manual notifications quickly and efficiently. AbLoads performs a uniform & secure check of every bridge along the route against the specific axle loads and spacings stated within the notification and a simple traffic light display reports to the operator the results. 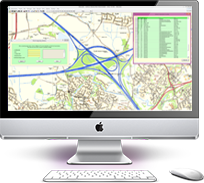 If a structure has failed at the checking process the software compiles an email back to the haulier with the relevant detail of the route issues. AbLoads is used to protect bridges, structures and drainage assets valued at £65 billion and is used in 60% of Highways England Agency Areas. How much does AbLoads cost? If you’d like to see AbLoads in action we’d be delighted to visit your offices and show you a live demonstration. Use our contact form to get in touch or give us a call. Send us an email by using our enquiry form. AbLoads used in 60% of Highways England Agency Areas protecting bridges, structures and drainage assets valued at £65 billion. Remove responsibility for staff, enjoy fixed budgetary costing and signitifcantly reduce your operational costs. Submit an abnormal load notification to all the correct structure owners and police forces in less than a minute. Simple. AbLoads® and AbHaulier® are registered trademarks of Cascade Software Ltd.